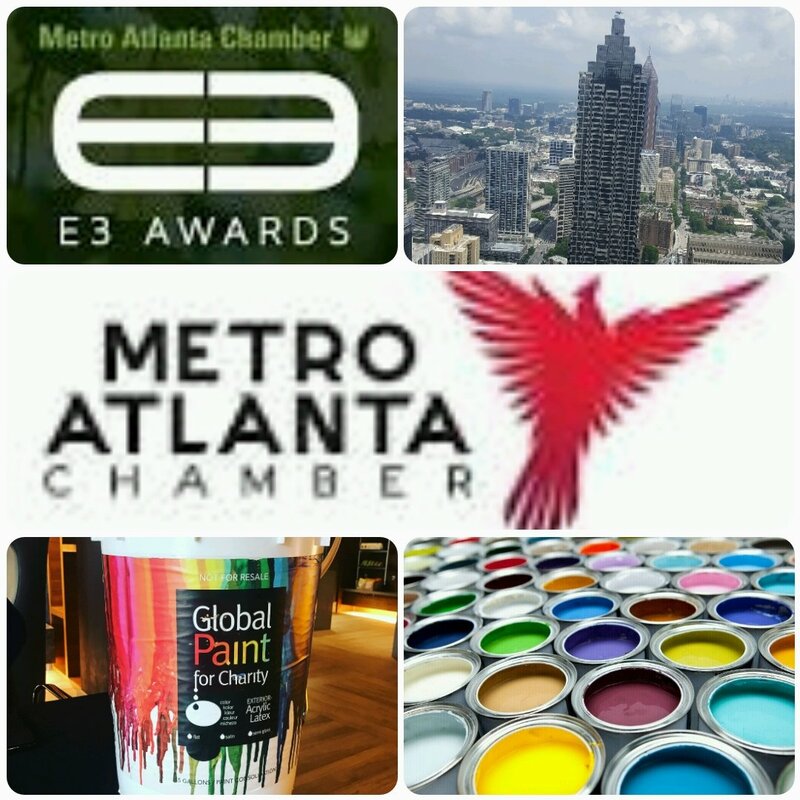 On behalf of our Board of Directors, Staffs, Volunteers, Supporters and Donors, we are incredibly honored to announce that The Global Paint for Charity has been selected as one of the FINALISTS IN 2017 ATLANTA E3 AWARDS. The E3 Awards celebrate the companies, organizations and people whose work conserving the metro region’s natural resources, development of clean technologies and support of sustainable projects and initiatives is deserving of recognition. 22 Finalists were chosen in seven award categories this year. The categories cover a variety of industry sectors, such as water conservation, renewable energy, recycling, smart growth and many more. A winner will be selected in each category during the E3 Awards special event at the Marriott Marquis, Wednesday, October 4, 2017. All of us at Global Paint for Charity are very grateful and thank you to the nominating committee at The Metro Atlanta Chamber (MAC) and to our supporters who have supported our mission by donating and volunteering. These folks truly are leading by example. This nomination recognizes how the Global Paint’s mission continues to resonate with millions of people around the world. And who doesn’t like colors? If you are interested in attending to represent and support Global Paint, please visit the link above to claim your tickets. We hope to see you all there and root for Global Paint to be the winner of our group!!! The Global Paint project was created to give each person in developing countries and those in need in the United States, we serve the opportunity to enjoy the beauty of their shelter through every gallon of recycled paint. Through our efforts, we strive to protect the environment, change lives, beautify and transform communities throughout the world. Since 2010, we have collected more than 200,000 gallons of paint and redistributed more than 160,000 gallons to help with renovations and rejuvenation of family homes, homeless shelters, basic schools, churches, orphanages, and hospitals in targeted communities around the world and in many major cities right here in the U.S. and the fair market value of such donation is 4.6 million U.S. dollars. All around the world, we can notice the immediate need of colors to bring hope and happiness in poor communities. It’s estimated that 80 percent of the world’s homes and schools face the dreary reality of unpainted walls in the underprivileged communities, and more than 70 million children have never had access to a painted classroom. While there may be more pressing issues in developing countries than the facade of a neglected wall, dusty classroom or a building, we believe that the right color in their rooms, and classrooms can truly change the ambiance and atmosphere of their environment and their livelihood. Thanks to our program success, we have donated paint to support our major projects in Liberia, Cameroon, Equatorial Guinea, Ghana, Kenya, Democratic Republic of Congo, Haiti, Salvador, Honduras, Guatemala, Mexico, Dominican Republic, Guyana and Jamaica. We still have a lot more work to do to be able to bring colors, hope, unity, peace and happiness to many other regions around the world. While getting people and businesses to donate paint isn’t a problem but collecting, mixing, repackaging and shipping the paint requires lot of funding. With just a small monetary donation from people like you and a little help from the corporations and private firms, we can make a real difference to better livelihoods around the world and help eradicate the causes and effects of poverty and sanitation solution. Your donation can provide buckets for repackaging the paint, cover transportation and shipping costs, or life-changing opportunities like supporting our micro-finance program. With your help, we can paint the world one gallon of paint at a time. Global Paint for Charity is a 501 (c) 3 non-profit organization, your monetary contributions and donations are tax-deductible. Keep following us on Facebook, Twitter, Instagram, and the blog on our website to learn about exciting updates about our programs in the future.